This resource from the Build Healthy Places Network guides community developers toward partnerships with hospitals and healthcare systems. Gain practical advice on navigating the vast healthcare ecosystem with your organizational assets in mind. Create your roadmap for partnership! 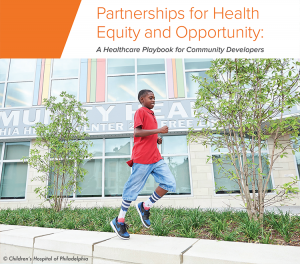 Download the playbook, Partnerships for Health Equity and Opportunity: A Healthcare Playbook for Community Developers. Download the Four-Step Path to Community Development-Healthcare PartnershipTM, a part of the playbook to help you assess existing partnerships or create a roadmap to new collaboration. Watch our Network Commons discussion about this resource and other community development-healthcare partnerships happening in the field. We created this resource, Partnerships for Health Equity and Opportunity: A Healthcare Playbook for Community Developers, because we know that community development can be part of the answer. As stewards for the communities they serve, the community development sector develops and finances the physical spaces, infrastructure, and essential services needed to live a healthy and productive life and can serve as an action arm for advancing population health and health equity. This playbook builds on the work of the many practical tools that exist to advance cross-sector healthy communities efforts. For community development corporations (CDCs), community development financial institutions (CDFIs), affordable housing developers, and other community development organizations, this action-oriented resource offers guidance to approaching healthcare systems and exploring untapped healthcare partnership opportunities that deepen the impact of community development efforts. For hospitals, health care systems, public health, foundations, and others, this resource outlines the community development sector’s potential role in addressing the social determinants and improving population health, and provides a tool to start the internal conversation with leadership about potential cross-sector collaboration. By joining forces to address the full range of dimensions of health, the community development and health sectors can achieve an unprecedented scale of prevention and advance good health, well-being, and opportunity for all. Let’s change the paradigm together! For more information or to find out how the Network can help you use this resource, please contact our team.